Use the summer months to add even more productivity to your business and supplement your Recon software with ReconCRM™ and make your workforce more productive than ever. ReconCRM™ can help you to monitor, follow-up, stay connected with your customers. This web-based software will track your sales opportunities or keep in touch with previous customers, automate your sales follow up workflow and provide you reminders. 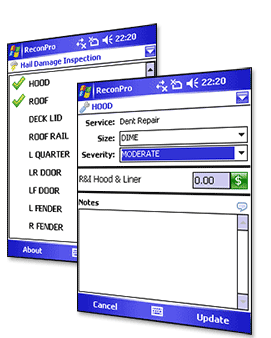 It is specially designed for the automotive industry and integrates with your Recon software. Set up and organize reminder emails and program system reminders for check ups, service reminders and system reminders. Add ReconCRM™ to your current Recon Suite product to track, upsell and close your sales to dealerships and retail customers. Hail Season Special Extended – In June, AMT Technologies announced its new Hail Damage Package (HDP) and a special for automotive reconditioning professionals. You still have time to take advantage of hail season specials. Whether you are an existing customer or new to our Recon Suite of products, you will receive HDP for 1 month free if you subscribe in July. Remember hail season can last until October, so take advantage of these specials today.